The otter was pottering in the reeds. He had the sensation that he was being watched, but that did not prevent him from blazing his own trail. This time, it was a preset trail that he needed to find, because he was participating in the annual quiz walk in the animal forest. That was challenging enough, because it wasn’t by accident that the fox had won last year. She had been the best in answering the difficult questions, so this year it had been her turn to come up with the difficult questions. The otter had to count the reeds, had to know through which water he was wading and what the red sign meant at the waterside. That, he knew. It meant that no inflatables were permitted (whatever they were) or sometimes a sign said: ‘cable’ and then it was a fibre-optic thing (whatever that was). Yes, the otter knew his way in and around the water. That’s why he never fell for swimming under bridges. No, he would climb the bank, because one never knew what might be hanging over one’s head. Suddenly, he heard the dragonfly skim over the water. 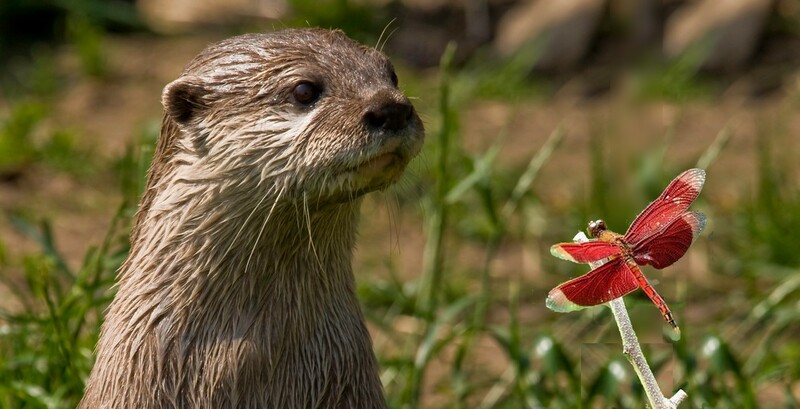 “Ah,” said the otter, “you shouldn’t skim over the water but dip into it, take a splash bath” and he showed her how to do it. Until he suddenly stood still and listened.